The National Florence Nightingale Nurses Award is given as a mark of recognition for meritorious services rendered by Nursing Professionals in the country. This award is presented on 12th of May every year on the occasion of the birth anniversary of Florence Nightingale and hence this day is also celebrated as International Nurses day all over the world. In respect to the above, Indian Nursing Council invites nomination for the award. 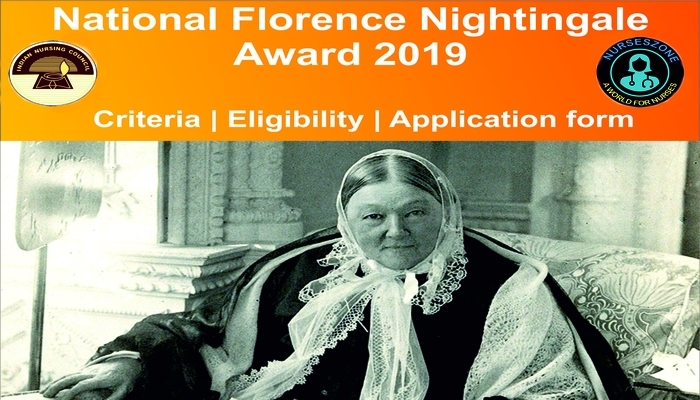 The National Florence Nightingale awards 2019 has now been transferred by the Ministry of Health & Family Welfare (Nursing Section) to Indian Nursing Council and as such all correspondence in this regard is to be addressed now to Indian Nursing Council (INC). The Nomination for the award will be scrutinized by a committee headed by Hon’ble Justice Shri Gopala Gowda, Former Justice of Supreme court of India. The award is given to outstanding Nursing personnel working in Central, State/UTs, Private, Missionary and Voluntary Organisations. This award consist of Cash Award of Rs. 50,000/-, a certificate and a medal. Apart from the nursing personnel employed in the state, central, autonomous institutions, the nursing personnel working in private, missionary and voluntary organisations are also eligible for the National Florence Nightingale Nurses Award and their application may also be forwarded after considering it in State Level Selection Committee in accordance with the laid down procedure, subject to their fulfilling the requirements. Selection criteria, application form, instructions for preparing the resume of the nominee, composition of the state level selection committee and procedure for selection of nominees for the award is enclosed at Annexure I to V.
You are requested to recommend at least a panel of three names for each category, i.e. Auxiliary Nurses & Midwife, Registered Nurses and Midwife & Registered Lady Health Visitors from your state. On completion of the selection process outlined above, the names of the nominees along with their resume and documentary proof in support of claim for the award may be forwarded to the President, Indian Nursing Council, 8th floor, NBCC Centre, Plot No. 2, Community Centre, Okhla Phase – I, New Delhi – 110020 latest by 31st March , 2019. (Tel. No. – 011 – 66616801). It is requested to keep the following important aspects in view, while forwarding the nominations. 1. Wide publicity may be given in the state to all the concerned stakeholders by issuing necessary circulars and up-loading the enclosed documents on the official website of the State Government. 2. It may please be ensured that applications for the nominations are received from private and missionary institution also apart from government institutions. 3. Representatives of the Trained Nurses Association of India (TNAI) at the State level or Associations should be included in the selection committee. 4. It should be ensured that the panel of names should include nominations in each of the three categories i.e. Nurses, Auxiliary Nurse Midwife and Lady Health Visitors. 5. It should be ensured that only such candidate are nominated who fulfill the criteria and proven evidence of outstanding work in their field and all the nominations are to be placed before the State Selection Committee Meeting. Download Criteria | Application form | Eligibility etc.